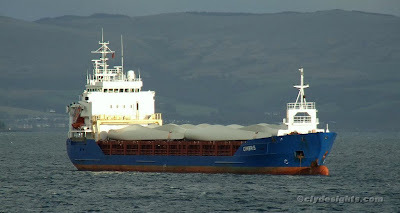 Lying at the 'Bravo' anchorage for a few days, the Gibraltar-registered coaster CIMBRIS is waiting to move upriver to discharge her cargo of wind turbines. She was built at the Rousse shipyard in Bulgaria in 2003, and is 98.86 metres in length. Her deadweight is 4,516 tonnes, and she is owned by Briese Schiffahrt.